A lovely lightweight jacket with mesh sides for all round weather conditions. 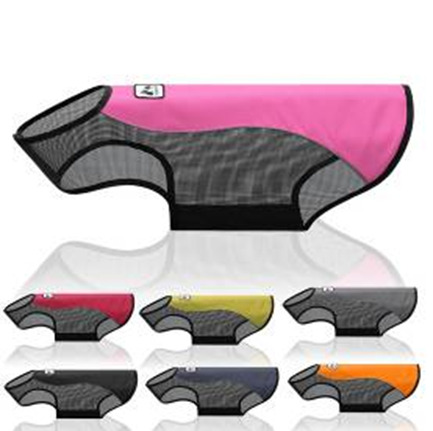 Bold coloured waterproof fabric covers your pets back while out in the elements of sun/rain or cold. Jackets have a durable Velcro that wraps underneath your pets stomach and around the neck, being velcro it makes them easy to fit and adjustable. These jackets can be washed on a gentle cycle and would recommend placing into a garment bag to avoid fluff or felt attaching to the velcro for lasting wear. Additional use - great to help keep insects/ sand flies and mosquitoes from getting into your pets fur and ribs. Use in conjunction with Citraguard spray. Use size guide and measuring guide in the Gallery to assist with your size requirements.